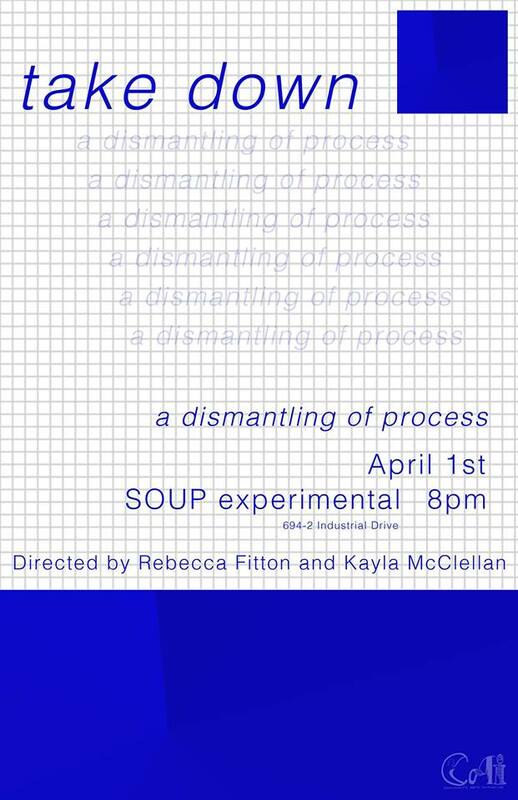 Join Rebecca Fitton and Kayla McClellan for an evening of performance supported by SOUP Experimental and the Community Arts Initiative on April 1st, 2017 at 8:00PM. There is a suggested entry fee of $5. Proceeds will go to SOUP experimental and its collaborators. Encounter, Expose lives in a nebulous reality that illuminates the innate fabrication of progress—considering what it feels like to consciously take on the various roles that make up that process. Intention, motivation, denial. How does a person justify what happens to them and what do they make it into? The work investigates these questions in a format that showcases a human tendency to continue transferring their understanding of past experiences onto new exchanges. Encounter, Expose recognizes the vast scope of control and explores what occurs when a person notices their ability to have a role on every part of the range. Kayla McClellan is a contemporary dancer/choreographer in her final semester of acquiring a BFA in Dance. McClellan is striving to promote physical and cultural growth through the participation in the fields of Dance Science and Dance/Movement Therapy; as well as, producing projects that are investigating how light creates dimension and what occurs physically, mentally, and emotionally when the scope of depth is uncertain. migrate border line is a physical exploration of how mass movement, interpersonal relationships and self-constructed barriers can alter the personal viewpoints of an unconsciously performative audience. Structured as a triptych, the three corresponding sections work to bring together those occupying the space and to dissolve the divide between performer and audience. Based in initial questions on how grief informs and affects creation, the work evolved into a reflection on what boundaries mean both physically and emotionally. Shown in a contemporary art gallery, the work is performed in close proximity to the audience as an attempt to further engage them in this group reflection. Structured through the three improvisatory tasks of research, recovery and re-shift, migrate border line is an ongoing exploration for all involved. Rebecca Fitton is an interdisciplinary artist from Appleton, Wisconsin. She works primarily with improvisational forms in alternative spaces. Her dance making focuses on the efficiency of structure, the creation of communities within performance and the politics of dance, often in collaboration with other artists and the audience. Fitton will graduate with a BFA in Dance with Honors from Florida State University in May 2017. Fitton has previously presented her work at the FSU Undergraduate Research Symposium and the School of Dance’s student choreography showcase, in addition to performances at Chez Bushwick (NY), Gallery Idio (NY), FSU College of Fine Arts, Gallery 621 (FL), and SOUP Experimental (FL). Fitton’s photography has been published by the FSU College of Fine Art’s magazine, SIX and FSU’s School of Dance.